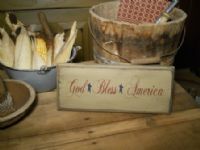 God Bless America primitive sign measures 1x6x13. A great way to show your patriotism this year. This one is shown in old ivory with red and blue stencil.